According to Rice University scientists, in the future bathing a patient in LED light may offer an innovative way to find tumors. Rice chemist Bruce Weisman and his co-workers developed the spectral triangulation system, which has the intention to identify targeted cancer tumors tagged along with antibody-linked carbon nanotubes. The study is explained in an article in Nanoscale, the Royal Society of Chemistry journal. 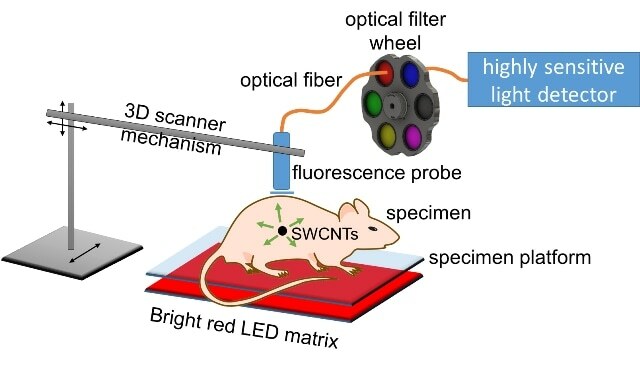 Since the absorption of short-wave infrared light in tissues differs with its wavelength, spectral analysis of light passing through the skin can disclose the depth of tissue by which the light has traveled. This allows the 3D coordinates of the nanotube beacon to be discovered from a minute set of optical measurements, which are noninvasive. The technique, developed by Rice University scientists, depends on the reality that carbon single-walled nanotubes when excited by visible light, naturally fluoresce at short-wave infrared wavelengths. An extremely sensitive detector referred to as InGaAs (indium gallium arsenide) avalanche photodiode could detect weak signals from nanotubes up to depth of 20 mm within the simulated tissue utilized for laboratory tests. We’re using an unusually sensitive detector that hasn’t been applied to this sort of work before. This avalanche photodiode can count photons in the short-wave infrared, which is a challenging spectral range for light sensors. The main goal is to see how well we can detect and localize emission from very small concentrations of nanotubes inside biological tissues. This has potential applications in medical diagnosis. Exciting the nanotubes by making use of LEDs is efficient — and cheap, said Weisman. It’s relatively unconventional to use LEDs. Instead, lasers are commonly used for excitation, but laser beams can’t be focused inside tissues because of scattering. We bathe the surface of the specimen in unfocused LED light, which diffuses through the tissues and excites nanotubes inside. A tiny optical probe kept on the 3-D printer frame follows a computer-programmed prototype as the probe lightly touches the skin in order to record readings at grid points spaced apart by a few mm. This drawback is overcome by spectral triangulation. We make use of the fact that different wavelengths of nanotube emission are absorbed differently going through tissue. Water (in the surrounding tissue) absorbs the longer wavelengths coming from nanotubes much more strongly than it does the shorter wavelengths. If we’re detecting nanotubes close to the surface, the long and the short wavelength emissions are relatively similar in intensity. We say the spectrum is unperturbed. But if the emission source is deeper, water in that tissue absorbs the longer wavelengths preferentially to the shorter wavelengths,” he said. “So the balance between the intensities of the short and long wavelengths is a yardstick to measure how deep the source is. That’s how we get the Z coordinate. The detector is currently being analyzed in the laboratory of Dr. Robert Bast, an ovarian cancer expert and vice president for translational research at the University of Texas MD Anderson Cancer Center. The main author of the paper is Ching-Wei Lin, a graduate student of Rice University. The co-authors are Sergei Bachilo, Rice research scientist; Michael Vu, postdoctoral fellow; and Kathleen Beckingham, Professor of biochemistry and cell biology. The research was funded by the National Science Foundation, the Welch Foundation, the National Institutes of Health, and the John S. Dunn Foundation Collaborative Research Award Program.